While most people here are familiar with All Star mitts, very few in North America have seen/owned a Hatakeyama mitt. I have had an All Star mitt in the past and it is what the catchers on my high school team use. Over the past few months I have been breaking in a Hatakeyama AX-222 mitt, it has been the most difficult break-in I have ever done bar none. I still cannot close the mitt without great difficulty. I have used no treatments or creams, etc., just a mallet and a lot of shaping with my hand. Once I can close it enough to secure a ball, I plan on taking it to the cages and catching a few hundred buckets. The All Star mitt is what most catchers in MLB use as you all know. Further, it is tried and tested in every level below that in North America. In Japan, NPB catchers use Hatakeyama and Mizuno almost exclusively. I have yet to come across a Japanese catcher playing in the Pacific or Central League that uses an All Star mitt despite the fact that the All Star catchers mitt is made in Japan. Very strange indeed. I have asked a friend of mine who has been teaching in Japan for more than a decade to ask his students who play on the high school team there if they have ever heard of All Star and very few had. The ones that did was only because MLB catchers use them. From my observations so far, the Hatakeyama is put together better and the leather quality is superior to the All Star mitt. However I prefer All Star mitts because of their patterns and the fact that it won't take a century to break-in plus there is something about the leather that All Star uses for their palms which is undeniably wonderful. The Hatakeyama will last a lot longer than an All Star mitt but I'm still on the fence with regards to which I'd want on my hand if I was playing for in the Majors. I'd love to see more Hatakeyama gloves but at $400 each plus shipping and import duties from Japan, I don't see myself buying many more of these. My next purchase will either be a custom Mizuno from Japan or a custom Hatakeyama... I'm leaning towards the Mizuno because I am so unsure of the Hatakeyama patterns. In the end you really can't go wrong with either and given the price and availability of All Star gloves in North America, Hatakeyama will remain a Japan-only commodity. However if you catchers out there want something a bit different and want a glove that will last until the year 2093, then give Hatakeyama a try. Swallow Sports (www.4860.jp) is the best place to buy them in my humble opinion and they speak English! Any questions or comments, leave below or send me a PM. I love talking catchers mitts and gear. Wow, I just checked on justballgloves.com and All Star mitts are now made in the Philippines. I remember my All Star had "Made in Japan" on it... not that it matters all that much these days. 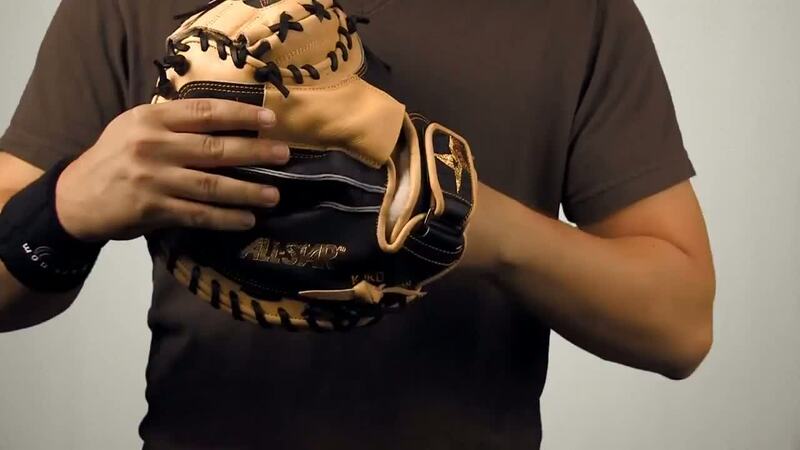 99% of top of the line Mizuno gloves are made in China and Asics (think Yu Darvish's glove) has completely moved all their factories from Japan to the Philippines a few years ago... even their custom stuff is now made in the Philippines. I think other than maybe the Pro-Elite, they are made in the Philippines. The Pro-Elite may still be made in Japan. One thing I've learned about info from justballgloves and justbats.com... there's about a 50% chance, that the info is accurate. This image is the best I could find, you can see the "AN" of "Made in Japan"... can anyone who currently owns an All Star chime in? Screw the All Star (I see one of those, most every day of the week)... how 'bout some pics of the Hatakeyama. Those AX-222's are beautiful mitts... I love the chocolate brown models, too. My Rawlings HOH Matt Weiters is also REALLY stiff. Id love to see the Hatakeyama. I love chocolate colored mitts and I've been wanting one of these forever. Huge difference in terms of shape/style in american and Japanese catchers mitts. I've caught with both, I never got used to the way the jap style handles the ball, and I've never seen anyone besides myself here in China catch with the American style. I once brought my easton mitt (average mitt, not an AS mind you) to a factory to have it relaced here. I remember when the guy opened it up and started laughing. He called some other coworkers over, and soon enough I/my mitt, become the laughing stock of the factory. Not sure exactly what the fuss was about, but pretty random experience haha. I really like the look of those Japanese Mizuno catcher's mitts but they do seem a lot more rounded than US style mitts. I've been meaning to update this with photos but life (young kids, work, wife, etc) have made things impossible. I am still breaking my Hatakeyama in... I don't get to spend much time with it but I've had it for more than a year and the damn thing refuses to break-in. The toughest glove I have ever seen. I cannot imagine how NPB catchers who get their gloves extra stiff manage to break the gloves in on time. I think most of them use the Japanese water bath method. I refuse to put my glove into water for any reason. Man, I actually think that I would buy Mizuno instead next time as this freaking mitt will be the death of me. Saying that, the glove will last until 2150 after several generations of use. I bought my son a black GMP2 a few years ago and the damn thing was so hard it was ridiculous. I took it and had it steamed and it still was rock hard. They did the steaming a few times. I eventually sold it and he now uses the Posey pro stock and that mitt is awesome, in my opionion the best on the market. The mitt is super broken in now so much so that the stitching in the pocket has worn away. He is working on breaking in the second one I bought him in practice and warmups. I don't understand how I haven't been able to break in properly... the leather is unbelievable on it and it is just so well put together that I can't find that point where the glove goes from new to broken in. Honest to goodness, I can't see this glove ever wearing out in my life time or my son's life time. Hatakeyama is unreal for quality. I've been pounding the pocket with a mallett and a ball. Both don't even make a mark on the pocket. Wow. I believe that this is what gloves were like in the olden days... quality leather that would last a life time.